Cambodia has 2 international airports, Phnom Penh and Siem Reap. There is also a domestic airport in Sihanoukville offering internal flights to Siem Reap. 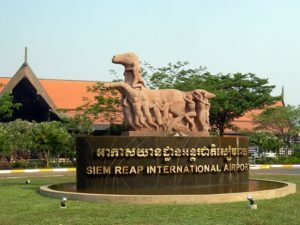 Siem Reap airport is 7 kilometres from the town centre and is a 20 minute taxi ride. Alternatively you can take a remork, (tuk-tuk), a sort of modern day rickshaw that is pulled by a small motorbike rather than a man. There are several internal flights a day, (50 minutes), linking Phnom Penh and Siem Reap, and regular bus services (312kms and 5-6 hours). In addition there are several land border crossings, between Thailand, Vietnam and Laos, and Siem Reap is on one of the main overland routes from Thailand to Phnom Penh. Siem Reap has a full range of accommodation, from $2,000+ per night suites to $3 per nigh dorm rooms. There is an excellent selection of restaurants and bars, and Siem Reap is compact, making travel across the town easy. Many hotels and guesthouses rent out bicycles for $1-$2 per day, and some have schemes where the proceeds go back to local charities. If you are looking for accommodation or somewhere to eat, you can check our Local Businesses page where you will find information on local businesses that have supported our work. To enter Cambodia citizens of most countries require a visa. A one month tourist visa (which can be extended for one extra month) can be obtained on arrival for citizens of most countries. If you are not sure if you require a visa, or whether you are eligible for a visa on arrival, please check with your Embassy. Passports should have 6 months validity remaining from the date of departure from Cambodia, and at least one empty page. Visas on arrival can be obtained at Phnom Penh International Airport, Siem Reap International Airport and selected land border crossings. The current price for a one month tourist visa is $30 and two passport sized photographs are required. You can also apply for an Ordinary visa on arrival. These are also for one month and cost $35. They can be extended indefinitely but people staying longer than 3 months may need a work permit unless they are a student, retired, or researching to start a business. It is also possible to apply for a single entry tourist visa online, an ‘e-Visa’. These cost $30 plus a further $7 processing fee. The ‘e-Visa’ is for 30 days, however it is valid for 3 months from the date of issue. Currently the ‘e-Visa’ is accepted at Phnom Penh and Siem Reap – Angkor International Airports, and most of the land borders. For further information and to apply for an ‘e-Visa’ please visit the Cambodian e-Visa website, http://www.evisa.gov.kh. You should always ensure that your passport is stamped on arrival, especially if you enter via a land border. Please note: a visa on arrival is not permitted for holders of the following passports: Afghanistan; Algeria; Bangladesh; Iran; Iraq; Pakistan; Saudi Arabia; Sri Lanka; and Sudan. If you hold one of these passports you MUST obtain a Cambodian visa before arriving in the country. You are also required to hold a sponsor letter or invitation from a company / project / travel agent, and you are also advised to hold a valid return ticket. A visa is not required for citizens of Malaysia, Singapore, Philippines and Laos.